Handtrucks2go offers you a nice selection of chair carts. Many choices to fit your need and budget. Looking for the full package? Make sure to check out our table carts as well! Works for folding and stacking chairs! Save Time, Space & Money! The chair cart is used to move folding chairs such as a resin folding, a plastic folding, a wood chair, or stacking chairs. Most chair carts have four wheels and are able to accommodate at least 80 pieces of folding chairs, 45 stackable chairs. Chair dollies come in handy during a big event which requires a lot of chairs while the event is taking place. Since the tasks of setting up and clearing up at any events can cause a major hassle to any event coordinator or event administrator, stackable chair carts can be really useful and it would be ridiculous and tiresome to carry lots of heavy chairs back and forth on your own. There are wide selections of durable ones available in the market for you to choose from depending on your needs. Chair carts may be different from each other in terms of its sizes and styles. Most chair carts are safe to be loaded, transported, and even used to store your folding chairs. Some have been painstakingly constructed to accommodate heavy loads and to be able to withstand many years of use. Chair carts are typically designed to hold mostly plastic or metal chairs with varying sizes, and chair carts are able to store chairs either in an upright position, a vertical position, or even in a horizontal flat position. Most chair carts are also equipped with storage kits or optional inserts which are able to accommodate additional chairs. By having this kind of option, you will be able to cut cost rather than having to purchase another two chair carts that are different in terms of its capabilities and sizes. Among the styles of chair carts available in the market that are mostly used by event coordinators and administrators include the Vertical Storage Folding Chair Cart (VSFCC), the Plastic Folding Chair Cart (PFCC), and the Chair Trucks Folding Chairs Hanging (CTFCH). The VSFCC has a solid construction, is able to transport and hold folding chairs in upright position, is equipped with 2 swivels, 4 castors, 3 tubular handles and 2 stationeries, and was made of powder-coated steel. The PFCC is perfect to store plastic chairs, has the features of ‘L’ shaped angled steel and the front wheels’ ability to swivel for fuss-free handling, has the abilities to stack up to 36 chairs and fit through a standard and conventional-height door. Meanwhile, the CTFCH is equipped with 4 swivel casters which are 4 inches each in diameter, industrial plastic wheels, 1 inch by 2 inches steel tube frame with 1 inch diameter, and hanging rods. The CTFCH is also able to hold high-back chairs and is 72 inches tall. Are you looking for the perfect companion piece of equipment for your table-cart? 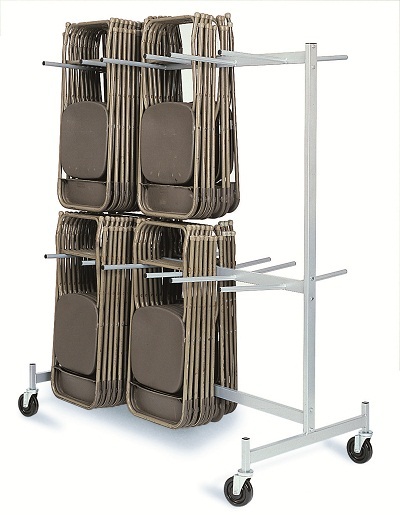 Is your home, church, school, or business in need of one or more chair carts? You’ve come to the right place at Handtrucks2go.com. The chair cart is used to move portable chairs such as resin folding chairs, plastic folding chairs, a wooden type chair, or stacking chairs. Most chair carts have four wheels and are able to accommodate at least 80 pieces of folding chairs or 45 pieces of stackable chairs. Chair carts come in handy during a big event which requires a lot of chairs to be moved. Whether it is for a church, a school, a home or a business function, a chair cart is an excellent piece of equipment to own if many chairs are in need of moving and set up. The task of setting up and cleaning up at many events can be a major effort to any event coordinator. Chair carts can be absolutely useful and necessary. A wide selection of durable chair carts is available for you to choose from depending on your needs on Handtrucks2go.com. Why go to the trouble and back breaking work of moving chairs one at a time, when you can move several chairs at a time with one chair cart? Chair carts are sold in various sizes and styles at Handtrucks2go.com. Most chair carts can be safely loaded, transported, and used to store your folding chairs. Some have been painstakingly constructed to accommodate heavy loads and to be able to withstand years of use. Chair carts are built to store chairs in an upright position, a vertical position, or in a horizontal flat position depending on the type of chair. Chair carts can also be equipped with storage kits or optional inserts which can accommodate more chairs. By purchasing this option, you can cut cost rather than purchasing another two chair carts that are different in capabilities and sizes. Everyone is looking for a way to cut costs these days and this is an excellent way to help a church, school, or business to keep the cost of moving their chairs down both now and in the future. The Chair Trucks Folding Chairs Hanging (CTFCH). The VSFCC has solid construction; is able to transport and hold folding chairs in an upright position; is equipped with 2 swivels, 4 castors, 3 tubular handles and 2 stationeries; is made of powder-coated steel. The PFCC is perfect to store plastic chairs; has the features of ‘L’ shaped angled steel; front wheels have the ability to swivel for easy handling; can stack up to 36 chairs; fits through a standard, conventional height door. The CTFCH is equipped with 4 swivel casters which are 4 inches each in diameter; industrial plastic wheels, 1 inch by 2 inches steel tube frame; with 1 inch diameter, and hanging rods. The CTFCH is also able to hold high-back chairs. It is 72 inches tall. Handtrucks2go is your best source for all of your chair carts!